Welcome back to another week of Fantasy basketball. Keep your eyes peeled on the waiver wire; there’s lots of opportunities if you know where to find them! This week in the NBA: The Stephen Curry-less Warriors finally broke their losing streak; rumours are circulating that Pelicans’ superstar Anthony Davis could be dealt, with trade options including Celtics and Lakers; and the Raptors continue their rule in the East. Now, let’s get moving with this week’s waiver wire recommendations. 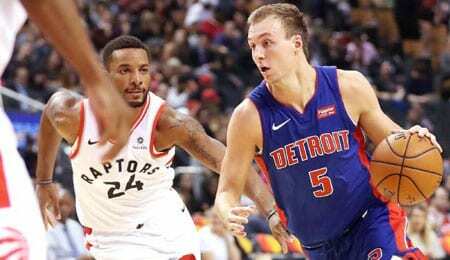 Luke Kennard, SG, Detroit Pistons (ESPN: 7.7 per cent; CBS: 5 per cent): The beauty is in the unknown when it comes to 22-year-old sophomore Kennard. The former Blue Devil hasn’t logged game minutes in a month’s time due to a persistent right shoulder sprain. Now that he’s participating in practice and most likely back in uniform within two weeks, it’s the perfect time to scoop him out of free agency. Open injury reserve slots are ideal for safe gambles — and a gamble Kennard most definitely is. If you can’t afford the risk, put him on your watch list and monitor his first few games back. Kennard has shown he’s got a nice touch, has some post moves and can hit a tough shot (see video below). Dewayne Dedmon, C, Atlanta Hawks (ESPN: 1.6 per cent; CBS: 35 per cent): Big Double D recorded his own DD (double-double) on Monday with 13 points and 12 boards. Dedmon leads the Hawks in rebounds (6.8 per game) and blocks (1.6) even while he has to compete for minutes with Alex Len. After Trey Young, Kent Bazemore and Taurean Prince, Coach Lloyd Pierce evenly distributes minutes throughout the rest of the team with Dedmon usually getting just over 20 per game. However, thanks to his efficient play, over the last week Dedmon is averaging 25.5 minutes. A rare perk attributed to him as a centre is that he’s excellent from the free throw line, shooting 89.5 per cent from the line this year. JaMychal Green, PF, Memphis Grizzles (ESPN: 1.6 per cent; CBS: 34 per cent): Immediately upon returning from his injury, Green has been producing for the Grizz. He’s a guy with huge upside, and given ample opportunity he could average a double-double and a couple blocks. With Dillon Brooks and Chandler Parsons each out with knee injuries, the spotlight is on Green and his next few games to see if he can earn his playing time for the rest of the season. You don’t want to miss out on the audition, so grab him before he’s hot and toss him back to waivers if the numbers fall when his teammates return. J.J. Barea, PG, Dallas Mavericks (ESPN: 14.5 per cent; CBS: 21 per cent): At 34, J.J.’s still got it. Some recent minor groin issues kept Barea out of the lineup briefly, but he’s made a quick recovery and has been cleared to play since Wednesday. In first game back, he managed 18 points to go along with seven assists off the bench against the Nets. Averaging 15.5 points and five assists over his last four games, Barea is playing better than a large portion of PGs that are owned in all standard leagues. He may not be able to maintain this level of play for long, but it’s time to find some good times with J.J.
Bryn Forbes, PG/SG, San Antonio Spurs (ESPN: 0.6 per cent; CBS: 21 per cent): Sharing the guard position with Patty Mills, Forbes has found a way to boost his game substantially since last season. Forbes dropped 20 points in New Orleans on Monday and has been averaging 12.7 points and 2.3 three pointers this season. Outside of threes and points, he doesn’t have much to offer owners, so at this point he’s another guy to have on your watch list to see how he evolves as the season progresses. Cody Zeller, C, Charlotte Hornets (ESPN: 0.8 per cent; CBS: 28 per cent): Zeller knocked down 15 points to go along with five rebounds on Wednesday against the Pacers, and two days later had 10 points, five assists and four rebounds in Oklahoma. As the No. 1 option at centre for the Hornets, he comes by his fair share of minutes (he played 35 minutes against the 76ers on November 17). Zeller’s a consistent, safe pick up if you’re looking for what he offers: essentially rebounds, points and small contribution to all other categories — which a lot of centres cannot offer. Canadian ’70s rockers Goddo proved that something good besides donuts could emerge from Scarborough, Ontario. In 1981, the band released Pretty Bad Boys, and from that album came “Pretty Bad Boy,” one of Goddo’s biggest hits ever. You’re up! Let us know who your favourite Fantasy basketball pickup of the week is in the comments below. This entry was posted on Sunday, November 25th, 2018 at 2:24 pm	and is filed under BASKETBALL, Brett Hamlyn, The Wire Troll. You can follow any responses to this entry through the RSS 2.0 feed. Both comments and pings are currently closed.